This year started on a Sunday, and I’m running my weeks Monday to Sunday, so I just added New Year’s Day photos to the beginning of the week. I’m not sure how I’ll juggle the “short weeks” at the beginning and end of each year with future volumes of Project Life, but for this year it was okay. (On a technical note — today the snow in La Ronge was melting (! ), but it was still really cold out on my deck, and it was getting toward late afternoon (ie. less light), so I decided to try taking the photos inside by the window. What do you think? Does the lighting look okay, would it help me sleep with the leg wedge pillow? I didn’t notice until I was editing these photos that I was in such a hurry to get the spread photo taken that two of the cards slid out of their pockets! Oops. I’ll be more careful next time.) I took a lot of photos on our weekend trip, and those ended up being my first insert — I just cut a Design C page protector in half, but Becky Higgins has this three-pocket look now with one of her new designs, if that interests you. I think I may add a tab on the edge to make the smaller-sized insert more obvious, as it seems to blend in too much in these photos…. Anyhow — here are some closer looks at the individual pages. I really liked that Gilda Radner quote, and there was a good bit of “white space” on the postcard design for this title card, so I added it in. The photos include a post-midnight New Year’s Eve game of “Ticket to Ride: Europe” with our friends (and pastor couple) John and Timea, playdough on the Disney Princesses table Sara got for Christmas (I was aiming for a snail with my pink and green creation — there is a snail character in what was then Sara’s favourite DVD, “Babies Love Music”), John and Timea playing with Sara, and Bryan attempting to settle Sara for the night. I also journaled about my One Little Word for the year, which was “light”. I want to get back in the habit of adding this sort of memorabilia, which to me is one of the nicest things about the pocket pages — just slip those bits in, and they are preserved as part of our lives instead of just landing in the recycling box. The recipe was actually scanned in and added to some digital paper, just because it was too big, but you can still see the egg stain on it. 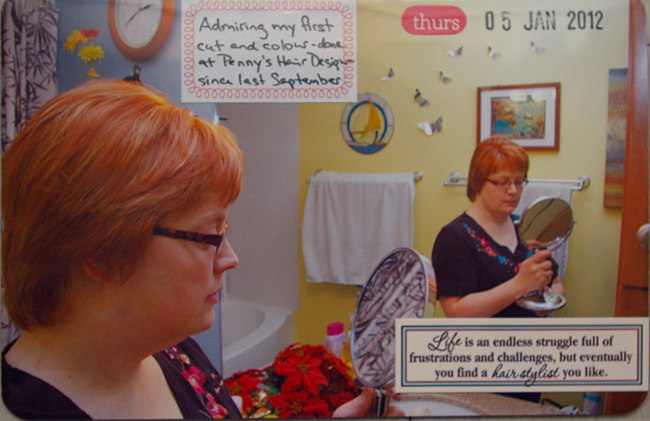 The photos here include a collage of images from a weekday at home, me admiring my new haircut, a hospital stay, and a visit with friends in Prince Albert, the city nearest to us (a 2.5-hour drive). Isn’t that the best quote?! I had some medical tests done that week, and ended up fainting — very strange experience. I had my husband take a photo with his Black Berry (good scrapbooker, right? 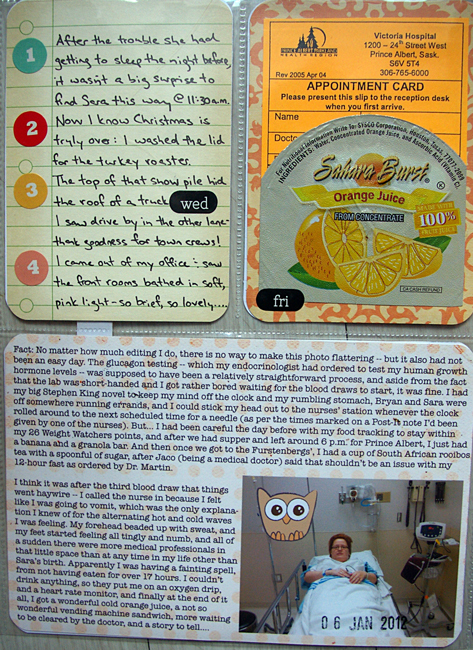 — must stay dedicated to the cause… ), and also saved my appointment card and the lid from the orange juice I had after my tests were done. The friends we stayed with in P.A. 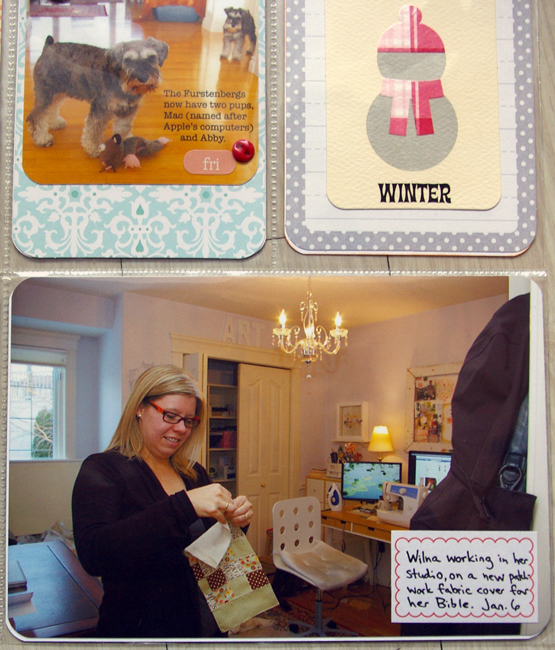 were Wilna and Jaco Furstenberg — Wilna is a fairly well-known designer/instructor in the scrapbooking industry, and we got to know her and her family because they live fairly near us, and Wilna taught an on-line course I took. They are from South Africa, so it’s kind of neat to be posting these pictures today — we had our first call via Skype this morning with our new supervisor in Johannesburg. The little photo is of the Furstenbergs’ dogs, and then there’s a seasonal embellishment that happened to be the tag from Sara’s new pajamas. 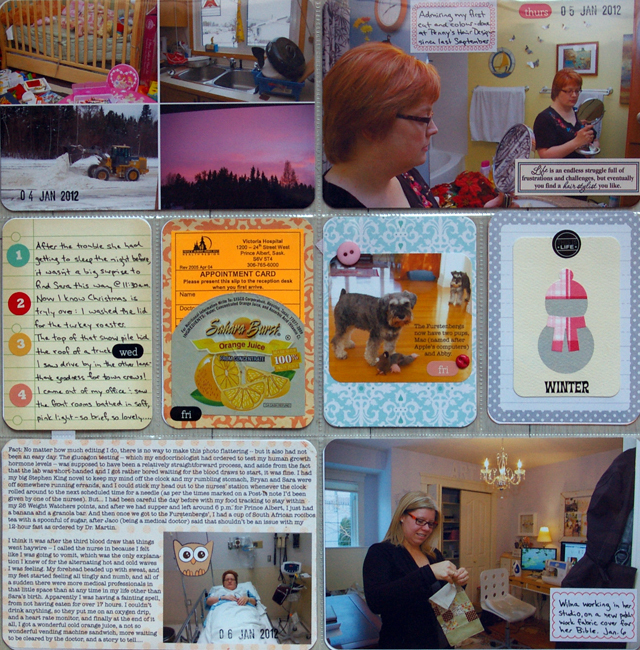 Front and back of the insert with our weekend photos — we had some missions support-raising appointments in Saskatoon, and stayed with friends who used to live in La Ronge, and also shared a meal with another SIM couple and their kids. 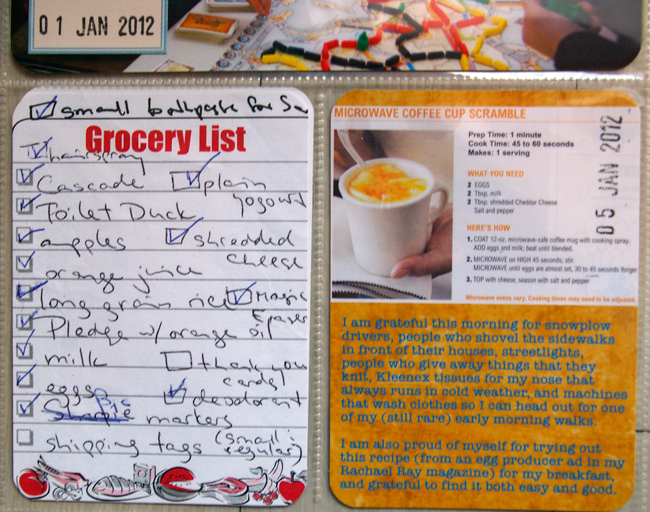 I love the pops of colors you use and also all the journaling you do! Great pages! What a fantastic job you’re doing on recording your year! 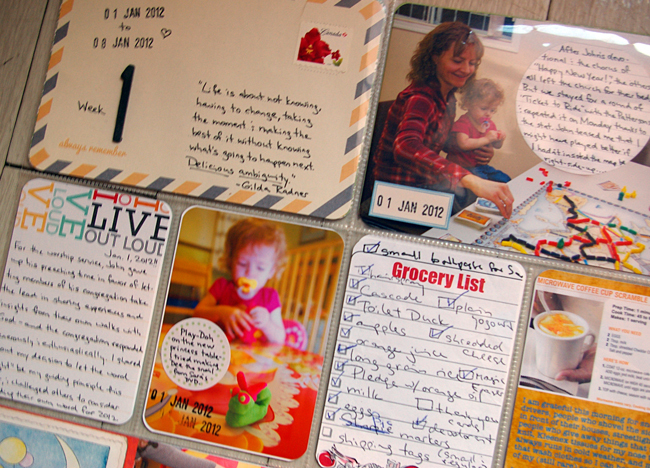 I love all the photos and the stories that you tell with your journaling. 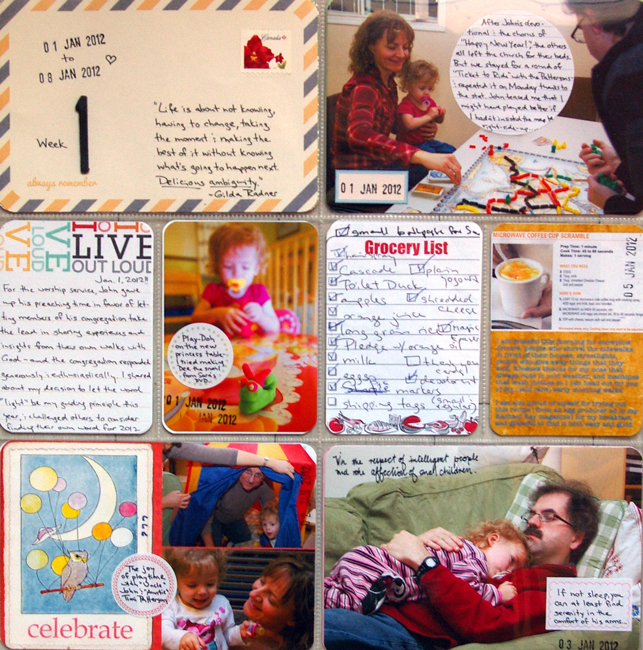 Great looking Project Life pages- now I know a bit more about you and you family- Sara is GORGEOUS! I chuckled at your grocery list- some things are universal- when you get to Joburg you will find Pledge & Toilet Duck on the shelves. In 2007, stars are still hiding behind their oversized designer sunglasses, creation fashion statements and protecting their eyes from the revolting effects of the Ultra Violet radiation. Today’s trendy designer oakley sunglassesare a level symbol; however, connections behest to exhibit modern effect sunglasses, you attain not count on to bestow up kind. Quality designer oakley sunglassesculpability be polarized to reduce the notice of sunlight reflecting rub out surfaces like the highway, cars, moisten or snow.